The Friends Visitor Center opened in September 2014 in downtown Luang Prabang as a way to spread awareness of LFHC and educate tourists and the general public on the health care situation in Laos. The first floor is dedicated to information on our programs, while the second floor houses photography, art, and textiles, related to Lao culture – all available for donation with proceeds going toward patient care at LFHC. 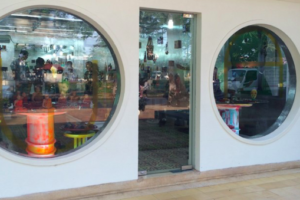 The Friends Visitor Center is located on Kitsalat Road, Luang Prabang, Lao PDR. If you are traveling to Cambodia, visiting the ancient temple of Angkor Wat will be at the top of your list of things to do. You will quickly realize there is a whole lot more to do in Siem Reap as this article from the Unearthing Asia site describes. One thing that the author didn’t unearth is a visit to the Angkor Hospital for Children – an experience from Cambodia you will not forget. Visiting the hospital gives you the opportunity to see first hand what our fund-raising efforts are all about. We can help you to arrange a visit – get in touch with us by phone or email through the Contact page. If you are looking for some gifts and mementos from your travels, consider visiting these artisans, designers, and artists. Each has been a long time supporter of our efforts at AHC and MAM offering up donations in a heartbeat to support child healthcare. 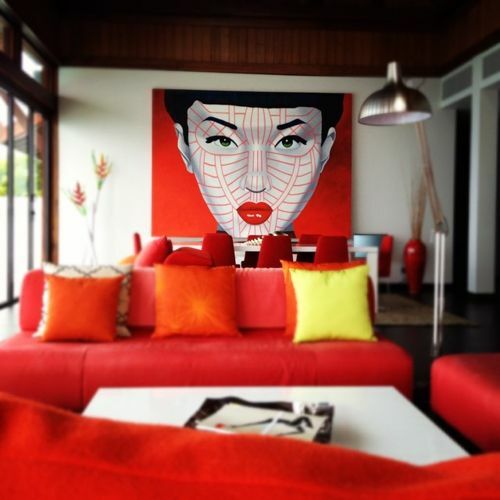 Christian Develter’s atelier in Cambodia. Designed in 2016 by Asma Architects asma-architects.net , the semi open structure features both elements from Phnom Penh’s 1948 central market to facilitate a natural airflow and 798 District in Beijing to catch the prefect light for the artist to paint. Warp studio is located nearby a 12th Century Hindu temple Wat Atvea six km south of down town Siem Reap . The temple is devoted to Lord Shiva and constructed during the reign of King Suryavarman II who also built Angkor Wat. 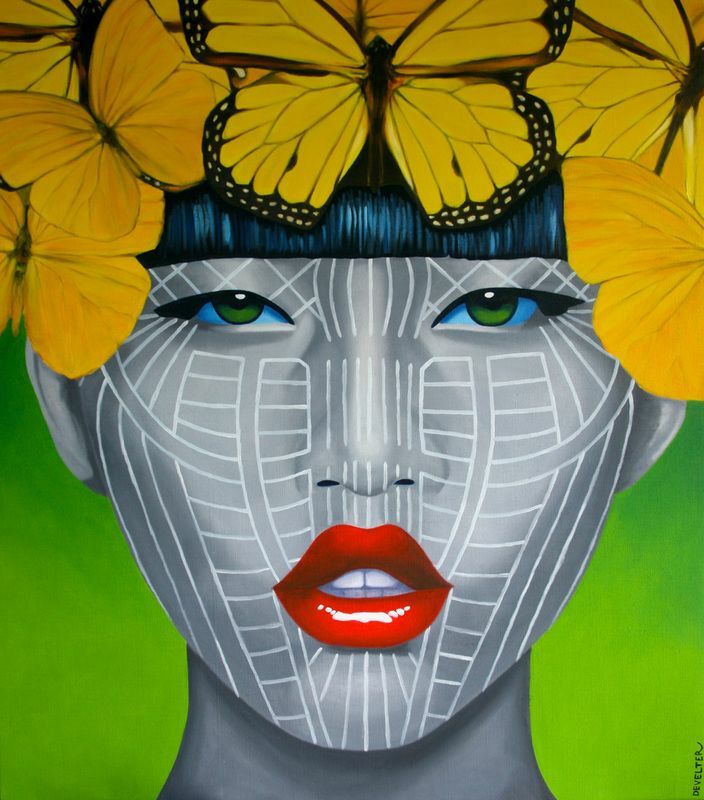 This gallery/concept store has two outlets in the FCC and one across the street from Shinta Mani. 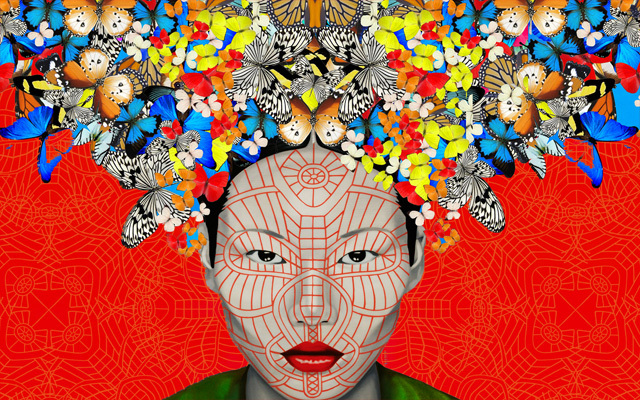 The work of edgy contemporary Vietnamese artists and craftsmen are on offer, so if you want a brightly colored Buddha head or funky ethnic jewelry, stingray bangles or horn rings, this is a bit like an Asian Conran shop. Silk-weaving project Weaves of Cambodia opened its first shop this month, in the Visitor Centre at Angkor Hospital for Children, where it will sell its trademark high-end silk scarves, cushions and bags.The Weaves of Cambodia shop will hold a grand opening on January 22, to coincide with the fifteenth anniversary of Angkor Hospital for Children. Read the full story in the Phnom Penh Post. Visiting Laos? 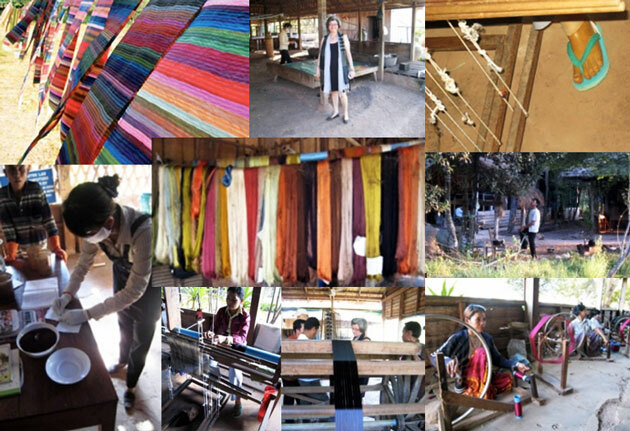 In Vientiane, stop by Carol Cassidy’s Lao Textiles workshop, studio and gallery that creates woven art. Specializing in 100 percent hand-woven silk, Carol and the 40 Lao artisans she employs produce exquisitely crafted wall hangings, scarves, shawls and custom furnishing fabrics. Carol’s pieces are displayed in galleries and museums throughout the Unites States: The Textile Museum in Washington, DC, The Philadelphia Museum of Art, and The Museum at the Fashion Institute of Technology in New York. Stepping inside the house gives visitors the feeling they are embarking on a walking tour of Cambodian art history and Lim Muy Theam’s own artistic development. Each room contains paintings, sculptures and furniture exhibits designed during his time at Artisans d’Angkor, as well as more recent examples of his solo projects. Many of these express the initial sense of displacement he experienced when returning to Cambodia as an adult after spending his childhood raised overseas by adoptive French parents. Lim Muy Theam’s sister Lim Maddy recently moved to Siem Reap from Paris with her family to assist him with his administrative affairs. 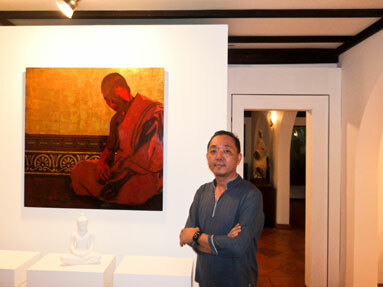 Former Cambodia Living Arts board president Charley Todd said he purchased one of Lim Muy Theam’s lacquered paintings as an investment and believes international interest in the artist’s work will grow. A generic whimsical style but each one is unique created by many different artists. The traditional Cambodia gold motif design is symbolic of protection and good luck to ward off bad spirits and bad energy. 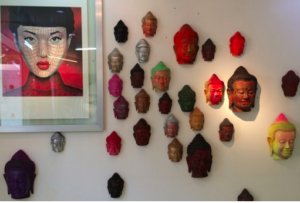 Galerie Cambodge is the newest venture of Nathalie Saphon Ridel of Khmer Attitude (a popular shopping destination in Siem Reap and Phnom Penh) and the husband-and-wife team of Loic Dumas and Sirivan Dumas (an established Cambodian shoe designer in Paris! 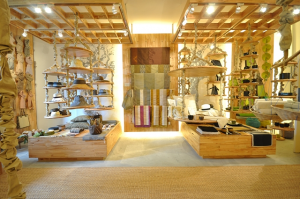 ), and is now open at the shopping arcade of the Raffles Grand Hotel d’Angkor. 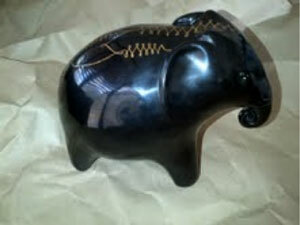 Selling fair trade-friendly, organic and Cambodian products, as well as exquisite products culled from all over the globe, the Galerie is a true treasure trove. Their most coveted item is the original Panama Hat, made entirely by rural villagers inEcuador, and is made of grade AA materials so fine that even of folded or crumpled, goes back to its original shape! Aside from a wealth of products made of cotton and silk, sandstone and lacquer, there is just a whole load of desirable stuff on the shelves. Definitely worth your visit, and your credit card!